All shrouds designed by HPConsulting Services are made to the specifications of the rotor that they will be used with. This ensures that results are constant at all times. 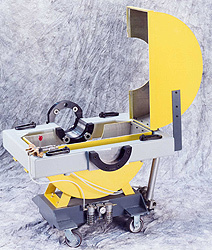 Shrouds are designed with a steel base, which provides a robust stand for the tool. Furthermore the shrouds themselves are made of aluminium and covered in epoxy paint, providing strong, superior protection, which can be used repeatedly. Shrouds are designed to enclose the rotor. This reduces windage and in doing so protects the rotor from damage. Shrouds also protect their user from the rotating parts. They can be frame or bed mounted and open using pneumatically driven actuators. The shroud itself is made from aluminium with a steel base and castors are supplied so that the tool can be moved when not in use. The use of a shroud protects its user from the rotating part. This means using balancing equipment becomes much safer. 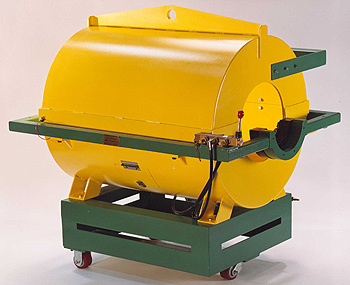 Customers have found that the castors mean that the shroud is very easy to move around the shop and as a result less staff are needed to operate the equipment. In addition shrouds also protect the rotor from windage and this reduces damage to the rotor.